Nicaraguan light flyweight contender Felix Alvarado (W33 KO29 L2 D0) has landed in Manila 7 days ahead of his clash with Randy Petalcorin (W28 KO22 L2 D1). The visiting warrior arrived via Ninoy Aquino International Airport Terminal 3 on Monday October 22 at 6:45 PM. 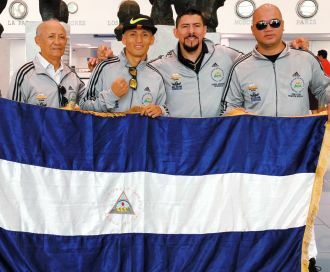 Alvarado is joined by his team led by head coach Luis Ernesto Cortez, assistant coach Wilmer Hernandez and promoter Pablo Osuna. Cortez’s veteran career is highlighted by being in the corner of Nicaraguan legend Alexis Arguello while Hernandez is a seasoned cutman who has been in the corners of Flyweight Champion Cristofer Rosales and Pound for Pound Champion Roman “Chocolatito” Gonzales. The Petalcorin vs Alvarado fight will be held on the evening of October 29, 2018 at the Midas Hotel and Casino, Roxas Boulevard, Pasay City and is being promoted by MP Promotions, Sanman Boxing, Peter Maniatis Events and ESPN 5. It will be broadcasted live at ESPN 5 7PM. Doors open at 3PM.